Join the Montana Angling Company and our Gallatin River fly fishing guides on your next Montana fly fishing trip and enjoy custom outfitting, expert guiding, and an authentic Montana fly fishing experience.Our guides all are fun, courteous, and experienced professionals that work hard to ensure your next fly fishing trip to Montana and the Gallatin River is your best yet. From its headwaters in Yellowstone National Park, through the rugged Big Sky canyon, and down through the rolling prairie outside of Bozeman, MT to its confluence at Three Forks, MT, the Gallatin River is a classic western freestone river that offers great fly fishing for anglers visiting Bozeman and Big Sky, Montana all year-long. The Gallatin River has excellent hatches, extensive public access, and high numbers of trout per mile, a combination that makes it particularly appealing for fly fishing anglers. Our Gallatin River guided fly fishing trips focus primarily on the stretch of the Gallatin River from the mouth of the Big Sky canyon, down to Three Forks, and in the summer months the stretch of the Gallatin River that runs through Yellowstone National Park. Anglers fly fishing with our GallatinRiver fly fishing guides can expect to both float and wade fish the Gallatin River, depending on the time of year of their trip. The Gallatin River offers great dry fly fishing during the Spring, Summer, and Fall months with daily hatches that vary over the course of the fishing season but includes stoneflies, terrestrials, caddisflies, mayflies, and midges. Nymphing and streamer fishing is great year-round, in particular in late-fall, early-spring, and during the doldrums of winter. Our special winter/spring trip rates are a great way to take advantage of the off-season action at a great rate. The Gallatin River through Yellowstone National Park, is a small, meandering creek that courses through some of the most scenic alpine country in the state. This stretch offers easy access to many miles of the Gallatin River from Highway 191. Mid-summer terrestrial fishing is the main attraction for fly fishing anglers on this stretch of the Gallatin River. Hoppers, ants, and beetles keep the wild trout of the Gallatin River looking up and eager to strike from mid-July through mid-September. Trout average 8-12 inches on this stretch and there are generally opportunities at larger fish often 15”+. This stretch is wade fishing only and offers anglers the opportunity of great dry fly fishing in a scenic and remote setting. After passing through the Yellowstone National Park boundary, the Gallatin River runs through the rugged Big Sky Canyon, and into the broad Gallatin Valley. 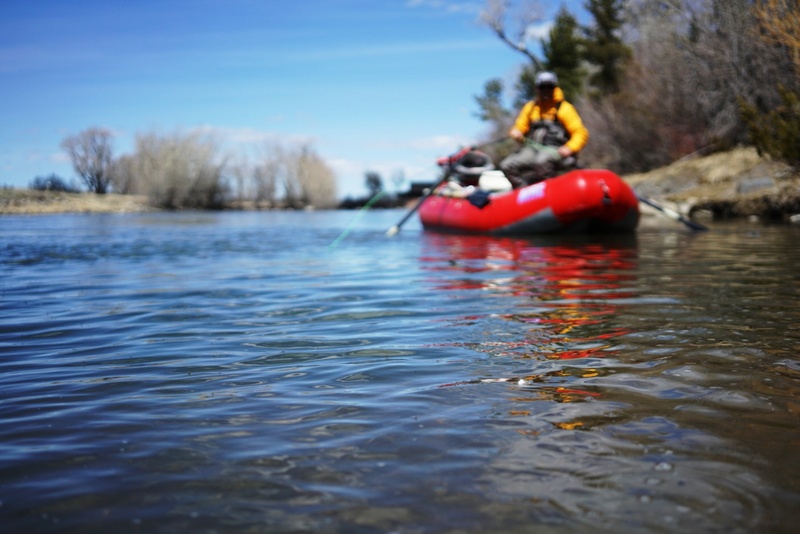 Due to whitewater, tough wade fishing conditions, and proximity to the highway we tend to avoid fishing the Gallatin River through the Big Sky Canyon. The character of the Gallatin River quickly changes at the mouth of the canyon, and our Gallatin River fly fishing guides consider the river from Williams Bridge to Three Forks to be some of the finest local fly fishing for anglers in Bozeman, MT. From Williams Bridge to the confluence with the East Gallatin River we primarily wade-fish the Gallatin River, but opportunities exist at certain flow levels to float the Gallatin River in rafts to access wade fishing spots far from the typical access points. Downstream of the Forks confluence we fish the Gallatin River from both drift boats and rafts. These stretches offer consistent fly fishing for wild trout that average12-14” with opportunities at larger brown trout. Great fly fishing, good hatches, and a wide diversity of water are all great reasons to fly fish the Gallatin River as part of your next Montana fly fishing trip. Proximity to the many other blue ribbon river near Bozeman, MT make it a great part of any multi-day package fly fishing trip. Our Gallatin River fly fishing guides have the experience and know-how to make your next fly fishing trip, your best yet.